A Cheerio yo-yo demonstrator helping a young award winner with "Rock the Cradle"--Cheerio's name for the trick (also known as "Rock the Baby"). The demonstrator is Frank Young. 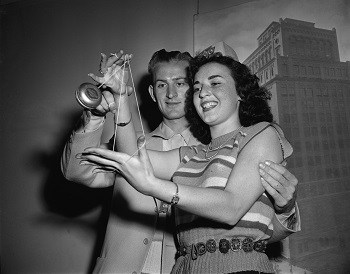 Frank was a 1938 runner-up at a Cheerio Yo-Yo contest in Vancouver, British Columbia; the 1939 provincial Cheerio Yo-Yo champion in Saskatchewan, Manitoba; a contestant in the 1940 Cheerio World Yo-Yo Championship in Toronto, Ontario. The name of the female player is unknown. Photograph is from the evening edition of the New York Daily News. Taken April 15, 1948 by Bernie Aumuller. Barely visible on Frank's sweater is the bottom portion of a Cheerio Champion patch (shaped like a giant maple leaf). The female is wearing a hat with a "I'm a Cheerio Champion" patch sewn onto it. All Cheerio-related items in this picture, including the yo-yo, can be seen in full color in other exhibits in this museum!